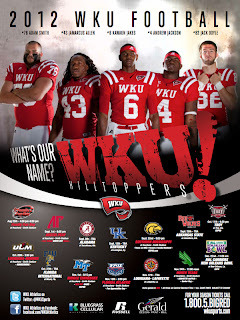 Western Kentucky gets points out of the gate for using a Corvette C7 as centerpiece in its poster. How cool is that? Check out those red calipers! Personally, I would have gone with the carbon fiber hardtop, but really, who's complaining? Jeff Brohm was 8-5 in his first season in Bowling Green, and by most accounts the Hilltoppers should improve on that record this fall. Western Kentucky has a new coach and league. Jeff Brohm, a longtime assistant to Bobby Petrino, takes over for Petrino, who is back at Louisville. And the Hilltoppers have moved from the Sun Belt to Conference USA. Western Kentucky is expected to have plenty of punch on offense but will need the defense to develop in order to make an immediate impact in CUSA. Willie Taggart did great work at Western Kentucky, taking over a team that was winless in 2009 and guiding it to a berth in the Little Caesars Pizza Bowl last season. His reward? A new job. Taggart is now coach at South Florida. It took less than a week for the Hilltoppers to find a replacement. Bobby Petrino, who left Arkansas in disgrace, was named coach on Dec. 11. Petrino is a proven winner, but how long will he stay in Bowling Green? Willie Taggart has done a marvelous job in his two seasons as Western Kentucky coach. The former Stanford assistant took over a program that had won only two games in its two previous seasons. The rebuilding job started slowly, with Taggart guiding the Hilltoppers to only two victories in their first 16 games. But the team figured it out and enters 2012 having won seven of its last eight. Click the image to enlarge. Thanks to Lindsay. Western Kentucky has won only four games since becoming a Division I-A member in 2008, but two of those victories came in Willie Taggert's first season as coach. The Hilltoppers' quest begins Sept. 1 against Kentucky in Nashville. Thanks to Lindsay. Click the image to enlarge.